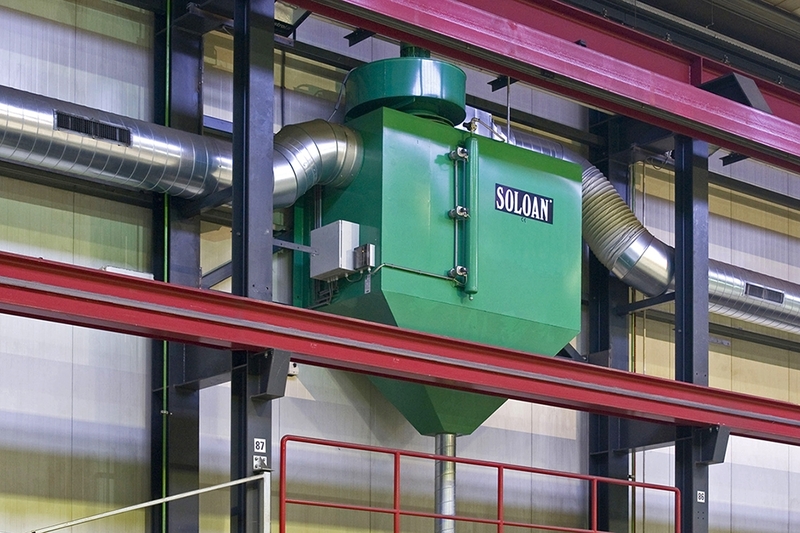 Metal processing companies can prevent exposure to welding fumes with a Soloan welding fume extractor installation. 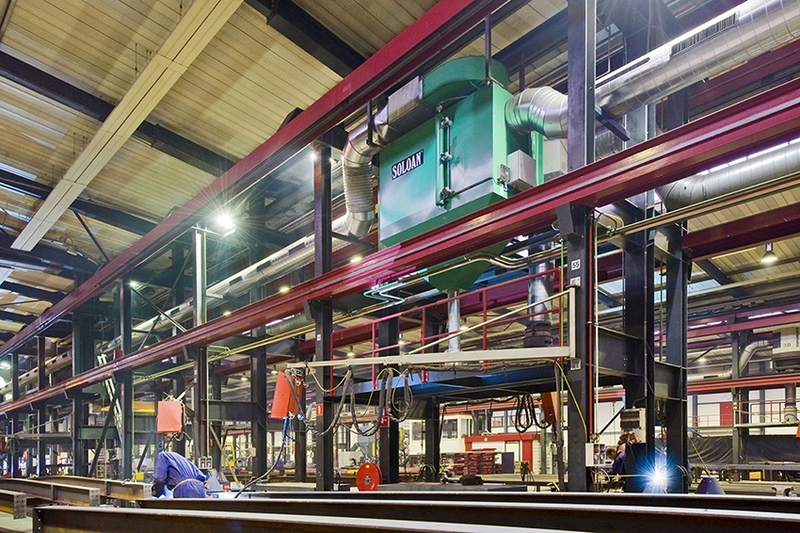 By combining our knowledge of extractor technology and heat recovery, we realize effective and economical installations for extracting welding and cutting fumes. 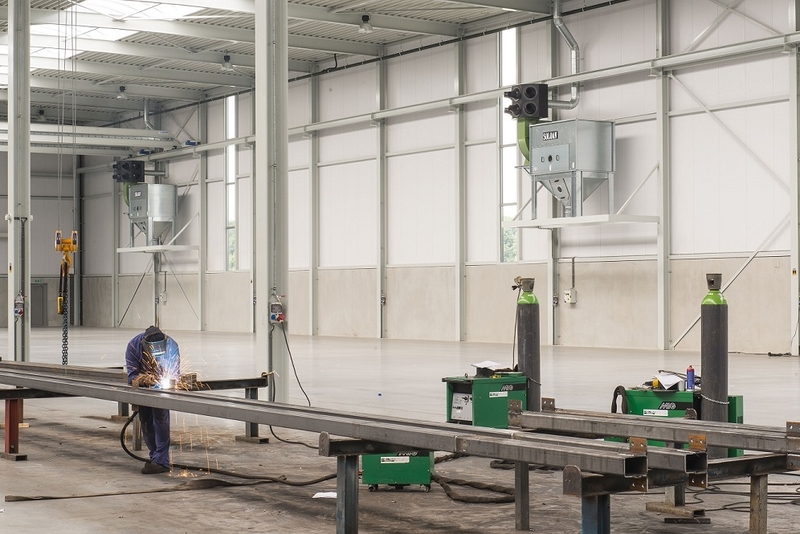 In addition to extractor arms for point or source extraction, we also build installations for spatial ventilation of entire production halls, for example. 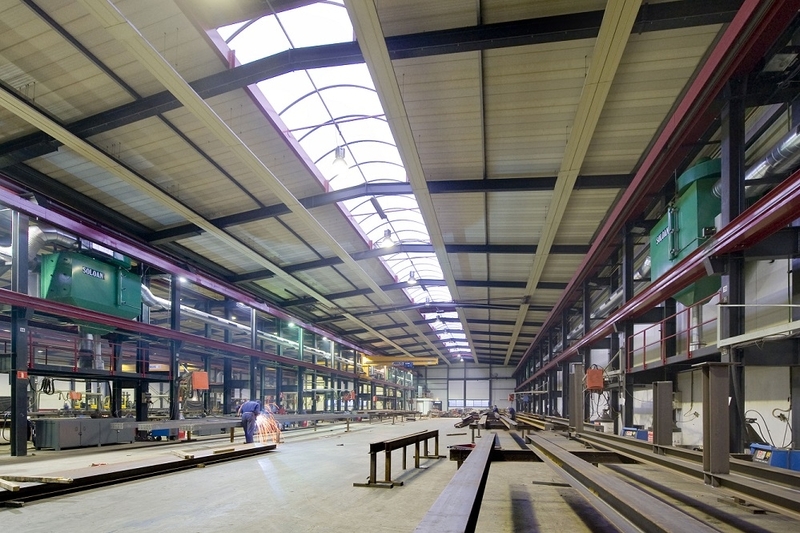 Our welding fume extractor installations with spatial ventilation are designed to ventilate large construction halls in compliance with the statutory provisions for welding fumes extraction. Because recirculation is not always desirable, we give you the choice between spatial ventilation and source extraction with or without recirculation. 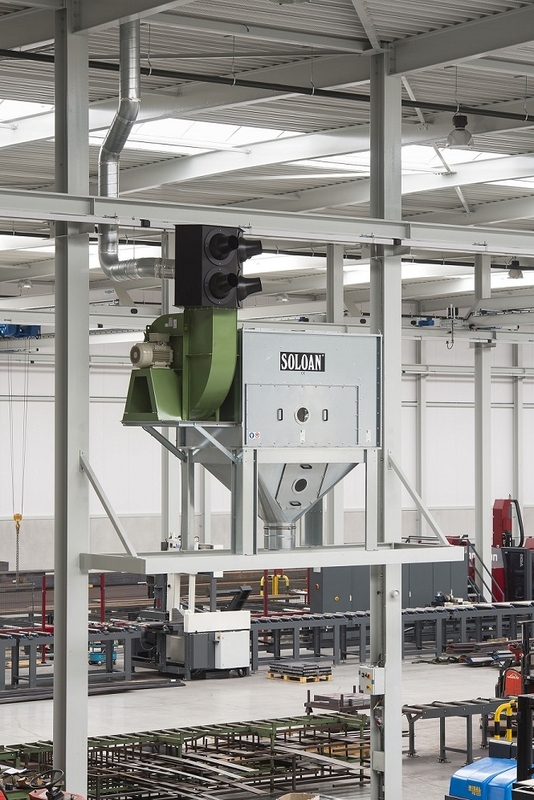 Diluting system: in this mixing system, the polluted air is extracted via a Compressed Air Cleaned Filter (PGF), filtered and blown back clean into the blanket of dirty welding fumes using a diluter nozzle. This creates a mixture of polluted and clean air, which reduces the concentration of welding fumes in the air. 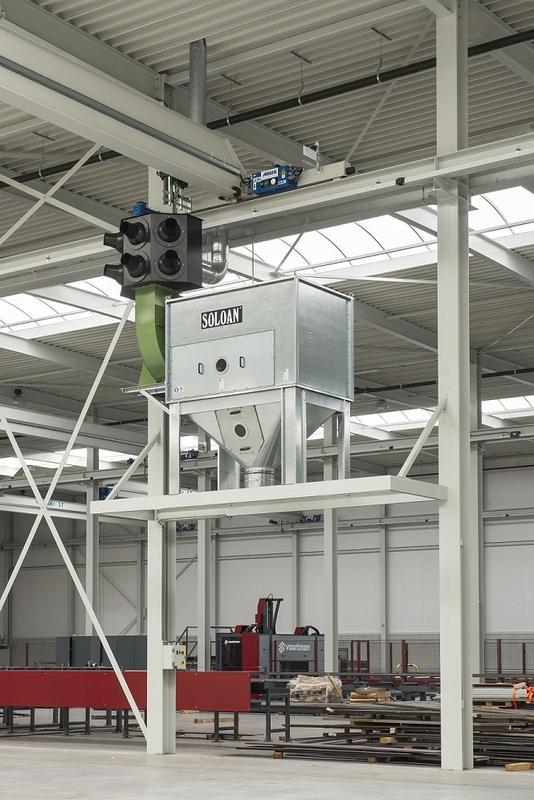 Push-Pull system: dirty air is extracted at the level of the welding fumes blanket (on average, three-fifths of the hall height) on one side of the hall and filtered by a Compressed Air Cleaned Filter (PGF) before clean air is blown back to the opposite site. The dirty layer of welding fumes therefore undergoes a push/pull movement. Obviously, the welding process should allow this. N.B. : During recirculation, 30% of the air quantity is always extracted in order to refresh the air in the hall. By spatial ventilation systems without recirculation of welding fumes, refrigeration occurs 100% with outdoor air. This method is suitable for welding processes for which recirculation is undesirable, such as for Stainless Steel. The 100% replenishment means that this type of system uses more energy. 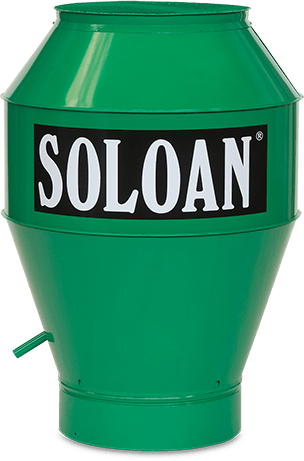 Soloan can, however, fit your spatial ventilation system with heat recovery which can save you 80% of your energy. By using a heat exchanger, up to 80% of the heat from the extracted air can be recycled to pre-heat the inflowing fresh air. This technology saves enormous amounts of energy, and certainly when the outdoor temperature is low. 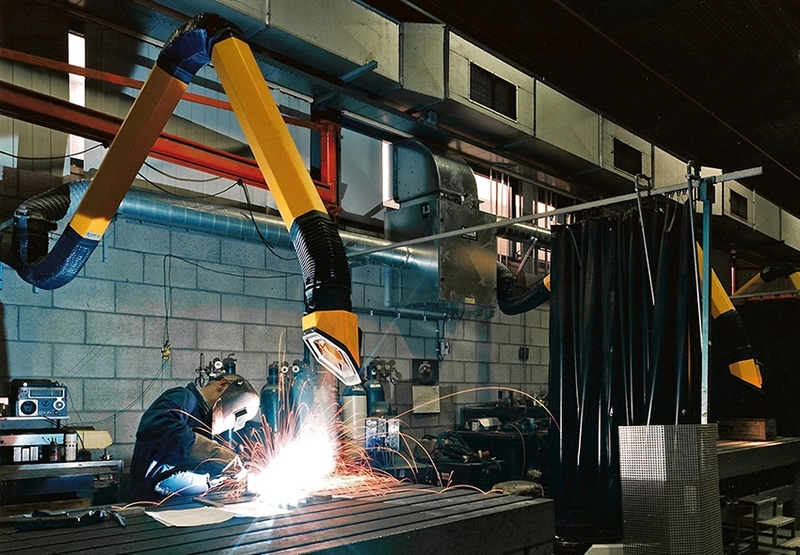 An extra saving is made on the recovered heat that is released from welding work. 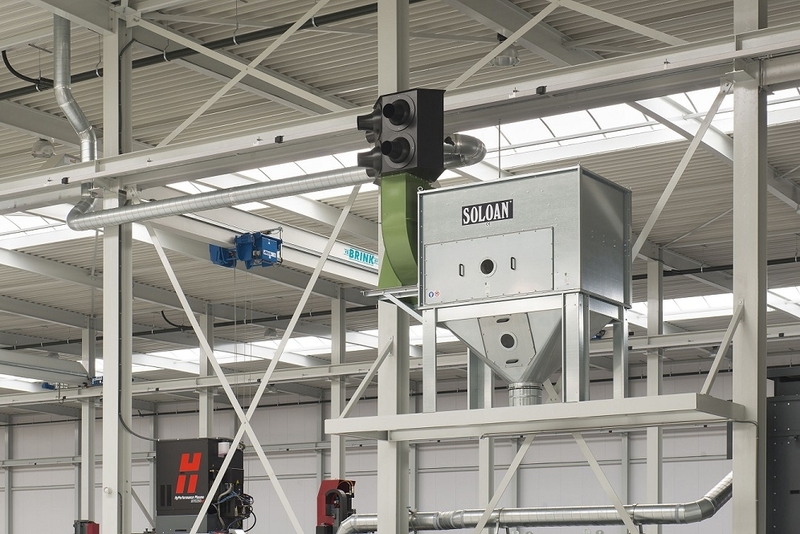 All Soloan welding fume extractor installations are fitted with automatic filter cleaning.